Now that Miss Universe 1998 has come and gone, I decided to give an overall commentary in addition to some afterthoughts. First of all, beginning with the Parade of Nations, I was terribly disappointed. I cannot believe that they showed neither the names of the delegates nor did they show their preliminary scores!! I thought that the 1997 Parade of Nations was absolutely flawless; they showed the names of the delegates, the cities from which they came, their preliminary scores, and they were actually in their native costumes, in addition to actually saying something!! This year, the girls just stood around like a bunch of ditzes! Besides, you learn much more about each country when the delegates actually say something about it that makes it unique! The parade of nations used to be an educational experience. The only thing I liked were the background pictures of the faces of the delegates. I am also extremely intrigued by all the stats, which include the preliminary scores,..now I may never know, how close some of my predictions and my other favorite countries were to actually making the top 10! Nor will I know any other country's ranking! AAARRRGGHHH!!! In terms of the scores, I'm glad they used a readable font instead of the one for Miss USA from which you couldn't distinguish whether that was a 9 or an 8 or a 3! In terms of dead ringers, could Miss Thailand be Brook Mahealani Lee's long lost twin??!! I could not believe how similar their heads were! Notice how Miss Thailand competed against 75 Thai women to win that title and she still didn't make the semifinals to Miss Universe, whereas Brook did while wearing a Miss USA sash, which further goes to prove that Brook may never have won Miss Universe had she been representing any other country! Another eerie similarity was that of Miss Uruguay, Virginia Russo, and Miss Teen USA 1996, Christie Lee Woods. It seems to me that some countries are starting to believe that making their girls look like American winners will get their country a possible winner! I liked the Parade of Nations video (awesome song) but not all the girls got equal time, nor could you tell many of the countries of each!! Moving on to the judges, WHAT'S GOING ON? !, 5 out of 8 American judges??!! plus 1 Canadian, 1 Asian, and 1 Venezuelan. Now, normally, I would be yelling complaints left and right, but fortunately for them, they made the right choice in the end so I'm not going to get too crazy over them, besides, after doing some calculations and playing judge myself, I discovered that if I was also a judge, USA and Colombia would not have made the semifinals, whereas India and Brazil would have. Hee hee hee!!! Moving on to the semifinals, I predicted all but Ireland and Russia. For some crazy reason, I thought they would let in an Asian country, after all, they were in Hawaii, and Bonaire had finally sent a bombshell after sending 3 duds!! My friend and I could not stop criticizing Miss Bonaire 95, Donna Landwier, who finished dead last that year, and you can just imagine our reaction to her cousin, Jhane Landwier, winning Miss Bonaire 97!! First, Miss South Africa, my score 9.99, she captured everyone with her stunning, magnificent gown. I think the whole world simultaneously said WOW upon seeing this gown. She was just incredibly beautiful and the attachments which she displayed were just amazingly beautiful. Miss Russia, my score 8.90, yuck, how could Ali possibly like that thing? The part just above the chest looked all tattered and out of place, making the gown look homemade, and the scarf which she was holding would have been more effective had it been longer...much longer. Miss Ireland, my score 9.25. Usually, in a pageant there is one delegate who does not really stick out and this year it was Miss Ireland, last year it was Miss Panama and in 96 it was Miss Peru. This was an okay gown but I thought she could have tried to fly like the other delegates. I'm such a sucker for those long scarves/attachments and I wonder why Miss USA had to lend her a dress, Hmmm.... Miss Brazil, my score 9.20, I think it was Ali's comment that made me give her a lower score than I should have because first impressions aren't always correct. I actually thought that the top part looked like some sort of Ancient structure, of which I can't remember the name, and the bottom was nice. Miss Colombia, my score 8.50, what the heck was that? I hated the skirt part with the other dress coming out and overall, I wasn't at all impressed. I found Miss Colombia more annoying than beautiful this year. (okay, after watching the pageant again, I am actually starting to like this gown so I'm regretting what I said. Hey, opinions change!) Will there ever be another Carolina Gomez? Now she had the gown of all gowns! Moving on, to Miss India, my score 9.99, India made a much smarter choice this year to replace that terrible mistake made last year when India placed last, let's never mention that year again,...sniff. 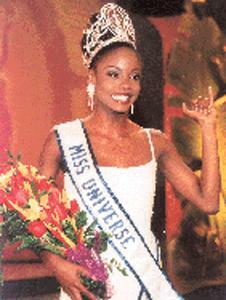 Miss Trinidad & Tobago, or should I say Miss Universe, my score 9.99. Of course, I favored her, always giving her 9.99 after all, she was my prediction to win. The gown was 100% sensational and she resembled a very enticing angel. Miss Venezuela, yet another white gown worn by Miss Venezuela, and this one was nice because it was fitted to her frame but I wasn't too impressed, my score was 9.10. Miss USA, how dare she copy that scarf movement she made to win Miss USA! That blinded me so badly and filled me with rage that I'm ashamed to say I gave her a 7.90! Finally, Miss Puerto Rico, I was surprised that Ali caught that her gown resembled that of Minorka Mercado, Miss Venezuela 1994, with subtle differences, my score was a 9.20 because she could have been better. In terms of the swimsuit competition, was it just me, or did Miss South Africa put on a little weight? Miss Russia was clearly sucking it in. Miss Ireland's swimsuit, dare I say, frowned (by frowned I mean, not hiked up at the legs). Miss Brazil, looked great as always. Miss Colombia, I thought her body was lacking. Miss India, why did she stand so straight?!! (whimper) She could have at least tried to show off her nice legs and her curves but she ruined it with that awful stance, didn't she learn anything from Manpreet Brar?! Stand crooked!! 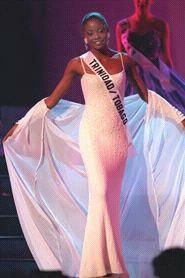 Miss Trinidad & Tobago, (drool), I think that says it all. Miss Venezuela,...need I say more, for Crying Out Loud, she's Miss Venezuela, what do you expect?!! Miss USA, I actually felt sorry for her having to follow Miss Venezuela because we all know what a jinx that is, but she looked decent. Her upper torso didn't look as extended, though. Miss Puerto Rico, can you honestly critique a former Miss Venus Model Search? Now to the interview, South Africa was excellent and deserved much much (I cannot stress much enough) higher scores. Miss Russia, somebody blow the ditz alarm! I don't think she learned much. Miss Ireland was excellent, how could the judges give her an 8.97?! Miss Brazil, her "English is my second language" remark instantly won my approval of her. Miss Colombia, nos caracterisse, nos caracterisse, nos caracterisse. They should have asked her more one question. Miss India, brilliant as always, she was much more extroverted than most Miss Indias and she added a little humor with her chili powder remark. Hey, I think India's bringing it on, they have to win again sometime soon. Miss Trinidad & Tobago, her remarks were a little slow coming out which surprised me but her answers were excellent. I loved her "Tokyo is partytown...and I know how to party" remark. She's a downgirl, so hip-hop and happenin'! I definitely made the right choice this year! Miss Venezuela was okay but I really don't think her interview was as high as the judges ranked. I also heard that the interpreter botched her answers which was unfortunate. Miss USA. Actually, I thought she competed much better in Miss Universe than she did at Miss USA. I was so certain that Shauna Gambill was going to win and I have been somewhat disrespectful to Shawnae because of that. Miss Puerto Rico, "myself, myself, myself, women are still women and women will always be women", she was a little overly repetitive!! But her Nelson Mandela comment was great. 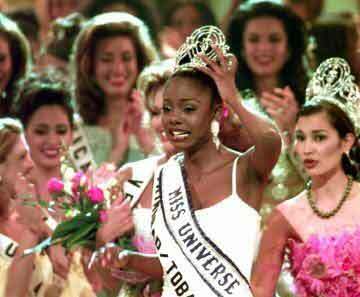 Overall, this pageant did not have the pizzazz of the 1997 pageant, and did lack in some other areas but the incredible delegates and the excellent winner made the pageant all the more enjoyable. 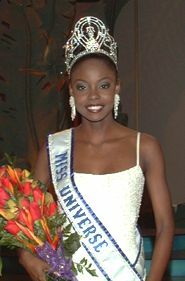 Congratulations Wendy Fitzwilliam, I knew you would be Miss Universe right from the beginning when you were crowned Miss T&T. In Madonna's movie "The Next Best Thing", there is a clip of Miss Universe 1998. What did Madonna have to say? Well, during the announcement of the top 10, they showed the announcement of Miss Colombia, Silvia Fernanda Ortiz. The announcer was not Jack Wagner, it was a voiceover. Remember when Silvia reacts by clapping her hands and going "Whoo!" and Miss Canada, Juliana Thiessen, looks over at her? Well, Madonna thought that Silvia looked like she was hooked on fen-fen. And they also showed the announcement of Miss Venezuela, Veruska Ramirez. Madonna goes, "Miss Venezuela looks happy." in a snickery tone and Rupert Everett said that she looked like she'd been smiling for two years straight! Well, it was rumored that Veruska had several plastic surgeries done! An interesting chronological error to point out. The time period when they were watching this was set in the year 1992 not 1998 so they probably should have been snickering at Paola Turbay (Colombia 92) and Carolina Izsak (Venezuela 92). Ah well!! They showed a brief clip of the 1998 top ten standing together as the camera zooms out from Russia's Anna Malova, to Michella, Lymaraina, and so on. But which semifinalist didn't get a cameo appearance is Madonna's new movie? It was the beautiful Kereshnie Naiker of South Africa!! The camera zooming out didn't include her in the shot unfortunately. Thanks Madonna for the promotion of Miss Universe! She should have been singing, "Bye, Bye, Miss Universal Pie" instead of "American Pie"! !